We’re into the all-star portion of the 2018 NFL Draft season as the nation’s best seniors put on the pads one last time before workout season begins. PFF’s production grades are in the books, but player evaluations are always ongoing, adding the new information from the offseason while reviewing the on-field performances from the fall. Here’s the latest mock draft, which comes through the lens of what I would do as general manager of every team, not what I think or hear is going to happen. There will be much debate as to which quarterback should go No. 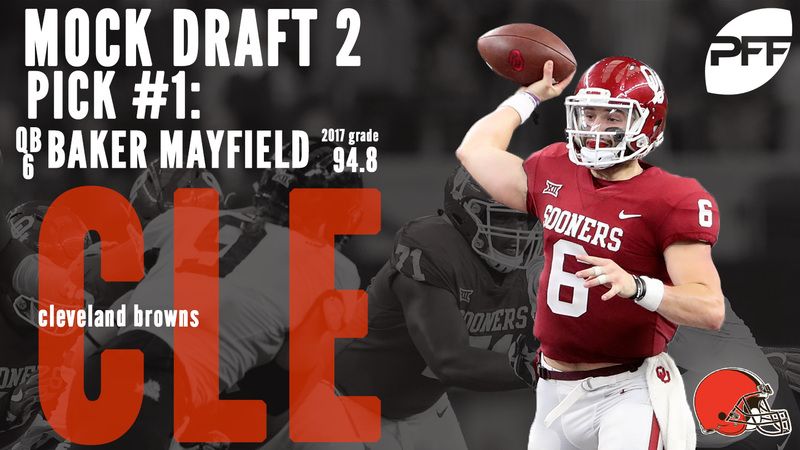 1 overall, but Mayfield has been the nation’s most productive signal-caller for three years running, and he should be in the mix. Yes, the Oklahoma offense eases his burden compared to his peers, but he’s still shown outstanding accuracy and decision-making, while making enough “NFL throws” that should instill confidence that his game will translate to the next level. Mayfield has posted the top PFF grade in each of the last two seasons. While 2017 did not go exactly as planned for Darnold, as his 83.6 grade ranked 30th in the nation, he did rank ninth overall last year with an 87.2 grade, and that came as a redshirt freshman. Even in his worst games, Darnold still showed the anticipation and accuracy that make him such an intriguing prospect. He just needs to prove that his turnover-worthy play percentage of 5.0 percent (105th in the nation) was more anomaly than the norm. The Colts can go a number of ways with this pick, but adding difference-makers on the defensive side must be an offseason priority. 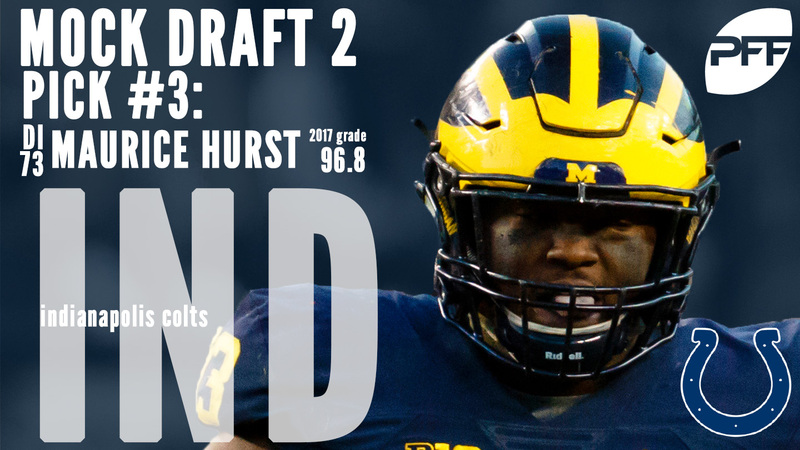 Hurst fits the bill as an interior disruptor, as he finished 2017 with the top grade at any position at 96.8. He notched 14 sacks, 29 QB hits and 70 hurries on 782 career rushes. He can also create havoc in the run game, as he ranked second in the nation with his run-defense grade of 94.2. Cleveland turns their attention to the defensive side of the ball where the secondary needs impact players, and Fitzpatrick can play multiple roles on the back end. He excelled in the slot at Alabama, ranking sixth among cornerbacks with an 85.2 grade against the run and allowed just 9.3 yards per completion in his three years. The big question is if he can hold up on the outside where he played just 13 snaps this past year, but at worst, he should be a versatile slot/safety hybrid capable of impacting the game in all phases. With the quarterback position still an issue for the Broncos, Denver turns to Rosen, who is excellent throwing to the intermediate level and has the zip and touch to attack defenses down the field. He posted the best grade of his career in 2017, finishing at 85.8, though he’s been consistent year-to-year, as he graded at 84.5 in 2015 as a sophomore and 84.9 in 2014 as a freshman. 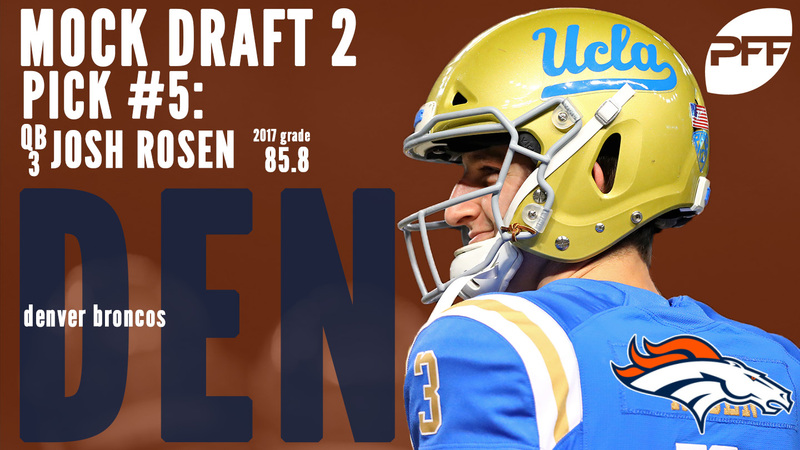 Rosen has some boom-or-bust to his game, but if he can cut down on the poor decisions, he as the talent to become a long-time starter. 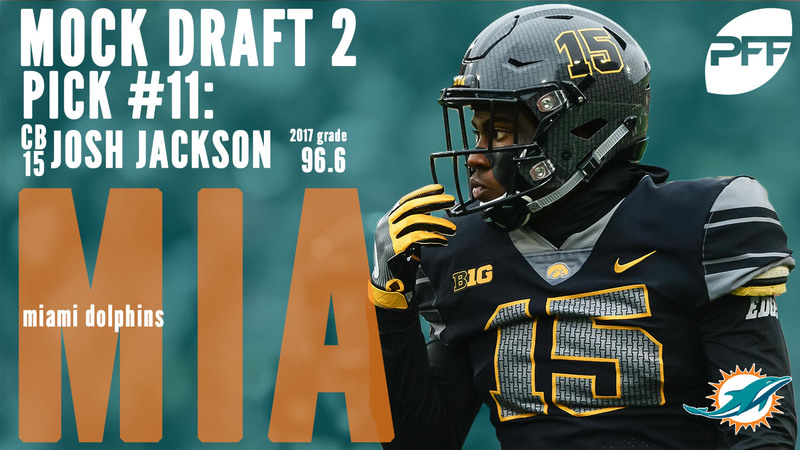 The opinions on Jackson vary around the league, but he’s a capable passer with outstanding, next-level athleticism, as evidenced by his top rushing grade among quarterbacks in each of the last two seasons. 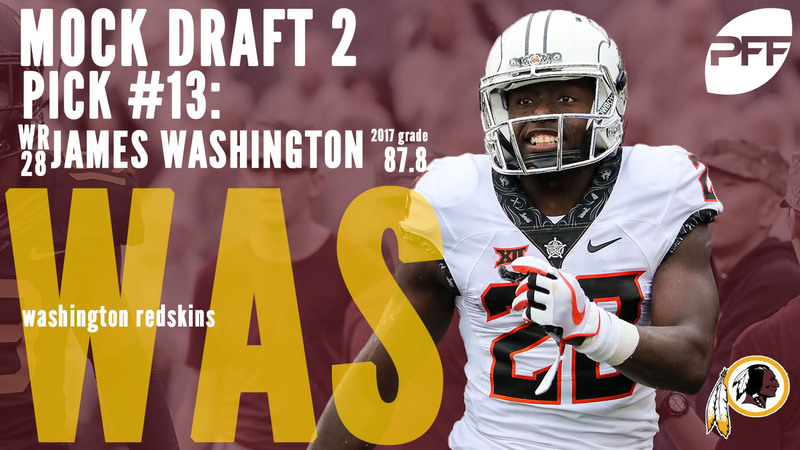 While his down-to-down accuracy needs work, he’s capable of making tight-window “NFL throws,” and that skill combined with his running ability should give offensive coordinators more than enough to build around. 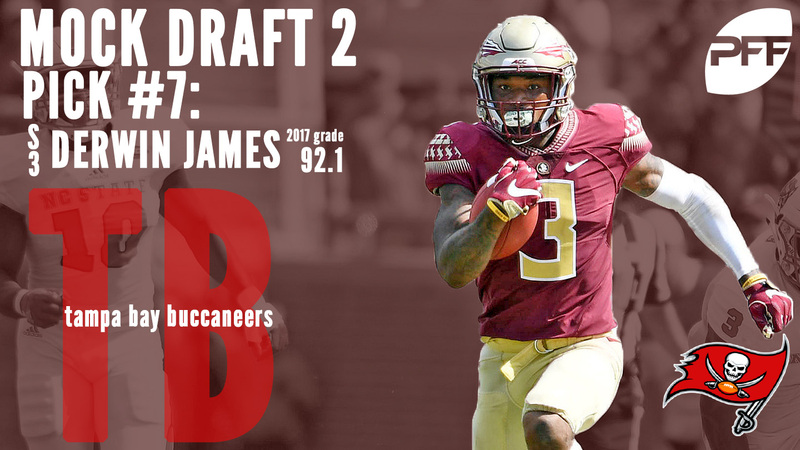 Perhaps the best defensive playmaker in the draft, James is the new NFL prototype as a safety capable of producing against the run or in both man and zone coverage. Florida State also used him as a pure edge rusher, where he regularly pressured the quarterback. The nation’s top-graded safety both as a true freshman in 2015 and as a junior in 2017, James is a movable defensive chess piece that can combat tight ends, slot receivers and opposing run games. Williams did not look like himself early in 2017, even before injury limited him to only 332 snaps on the year. At his best, Williams is a smooth pass protector (allowed only 27 career pressures on 986 attempts), and he gets to the second level in the running game and dominates linebackers. Left tackle Charles Leno Jr. took a step forward last season, but right tackle Bobby Massie has one year left on his contract and the Bears’ offensive line is very close to potentially having a top-tier unit. 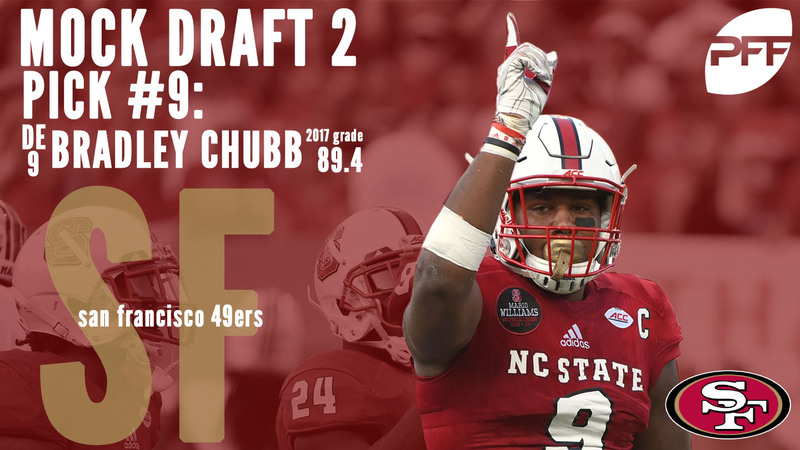 The defensive line has been a consistent theme to recent 49ers’ first rounds, but Chubb brings a different dynamic to the table. He finished No. 6 overall among edge defenders at 89.4, including the No. 3 mark against the run and the No. 11 grade as a pass-rusher. Running backs must be able to contribute in the passing game, and that’s just what Barkley can do after leading all college running backs with 632 receiving yards. He is dynamic with the ball in his hands and will add a three-down weapon to the Raiders’ offense as they transition to new head coach Jon Gruden’s scheme. Even if they ‘win’ the coin flip with San Francisco, Barkley would still be in play at pick No. 9. A breakout performer in 2017, Jackson led the nation in both pass breakups (18) and interceptions (8). His length and playmaking will upgrade an inconsistent Dolphins’ secondary that has struggled to keep up with its disruptive defensive line in recent years. The offensive line was a big issue for the Bengals last season, and they have questions at both tackle spots. Enter McGlinchey, who dominates at the point of attack, as he ranked in the top-10 as a run-blocker in each of the last three years, including the top mark this past season at 95.0. He’s also strong in pass protection to go with his experience playing both left and right tackle. From a strength in 2016 to a weakness in 2017, the Redskins’ wide receiver corps took a step back after the departures of DeSean Jackson and Pierre Garçon. Washington adds a deep-play threat after leading the nation with 715 yards on deep (20-plus yard) passes. He has the speed and route-running to be the first receiver off the board in a wide receiver class with no clear favorite at the top. Complementing a solid interior defensive line will be a priority in Green Bay, and Landry brings an every-down option off the edge. He had the nation’s No. 7 pass-rush grade in 2016, finishing with 18 sacks, seven QB hits and 44 hurries. He posted the No. 4 grade against the run in 2015, so we’ve seen him succeed in both key areas, and if he puts it all together, he could be the best edge defender in the class. There will be plenty of turnover in Arizona with QB Carson Palmer and head coach Bruce Arians both retiring, and they’ll certainly be in the quarterback market. 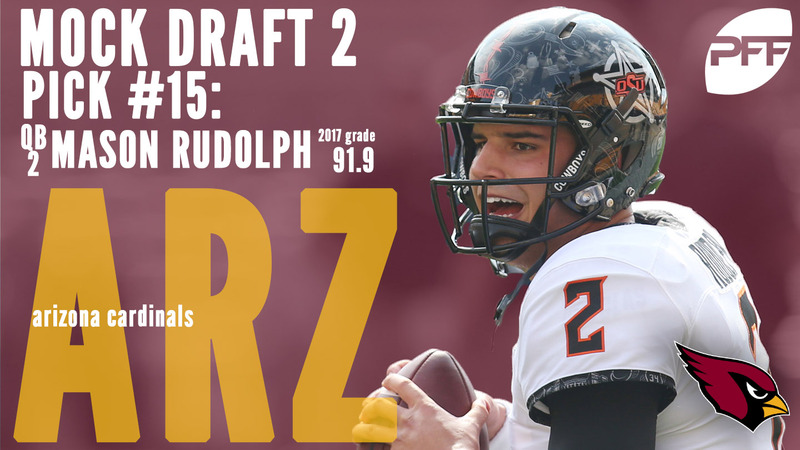 Rudolph has mixed opinions around the league, but he’s extremely accurate outside the numbers and finished with the nation’s No. 2 overall grade last season at 91.9 overall. Adding playmakers for QB Joe Flacco may be the top offseason priority, and Ridley brings a downfield, speedy option on the outside. His production at Alabama doesn’t tell the story given the run-heavy scheme, but he averaged 24.0 yards per target on deep passes, ninth-best in the nation. The Chargers’ offensive line rebuild took a step in the right direction last season, but there’s still more work to do. 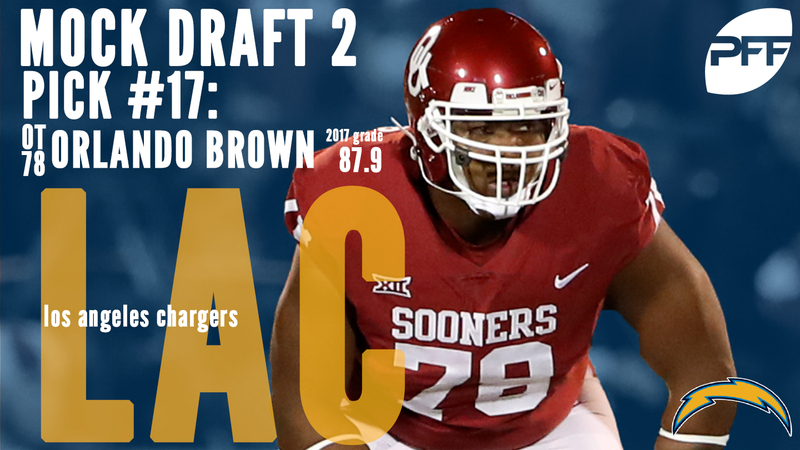 Brown brings a physical run-blocker and capable pass-protector to Los Angeles. He finished ninth overall among the nation’s tackles at 87.9, and his 88.1 run-blocking grade ranked fourth. It may be surprising to see Nelson drop this low in the draft, as he’s an exceptional prospect, but low positional value of guards is a big factor. Regardless, Seattle needs help up front and Nelson is dominant in the run game, leading all guards with a 96.4 grade in 2017 and ranking fifth at 89.5 in 2016. He’s improved every year in pass protection, allowing only five pressures last season. 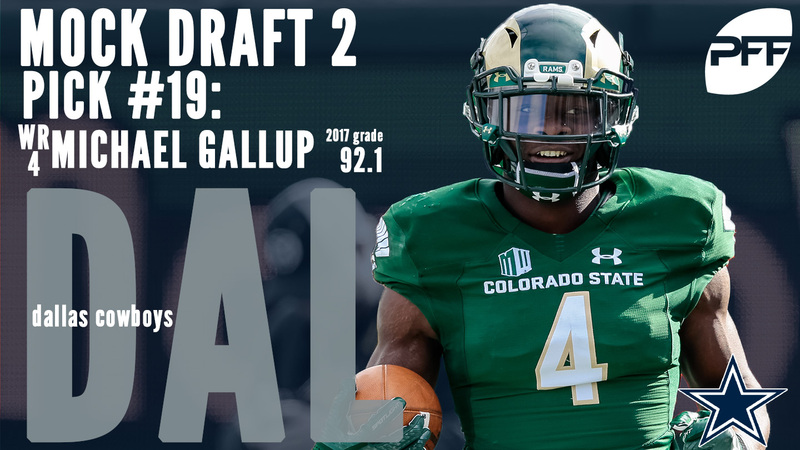 Dallas could go a number of ways here, but they add another receiving threat in Gallup, who can win with speed down the field and toughness at the catch point. He was the nation’s top-graded receiver in 2017 at 92.1 overall, and he adds another weapon for QB Dak Prescott. 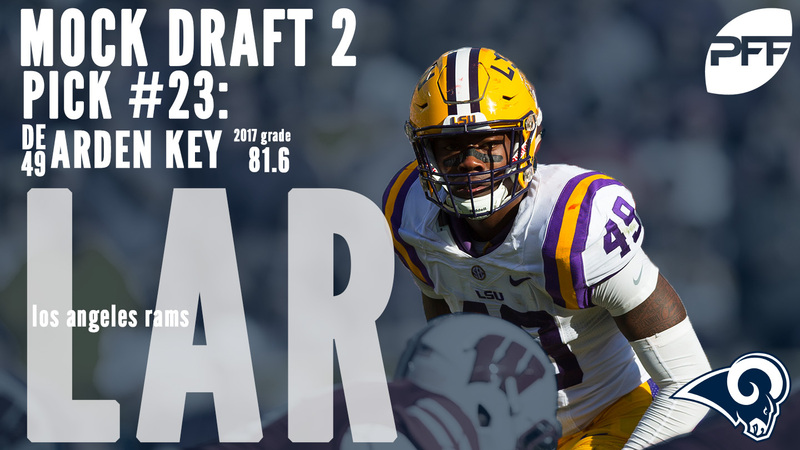 While the Lions will give edge defenders a long look, adding the massive Vea to the middle of the defense may be too good to pass up. More than just a 340-pound run stuffer, Vea had the nation’s No. 4 pass-rush grade (88.0) to go with his No. 3 mark in the run game (91.6). He can blow up blocking schemes and push the pocket, adding a necessary disruptor to the Detroit defensive line. The first linebacker off the board, Smith flies to the football against both the run and in coverage. He also has a knack for finishing plays, as he’s been one of the surest tacklers in the country over the last two-plus years (only 16 missed tackles on 251 career attempts). He’s a perfect fit for Buffalo’s zone-heavy defensive scheme. The Bills go defense once again, adding Davenport, who projects as a classic base defensive end in a 4-3 scheme. He uses his massive 6-foot-7 frame well and finished fourth overall among edge defenders with an 89.8 grade. He can move blockers in the run game and picked up nine sacks, six QB hits and 34 hurries on only 257 rushes last season. Need and value match up well here, as Key is a top-10 talent, but the 2017 season brought question marks both on and off the field. At his best, he has the burst to challenge the edge and the length to win multiple ways, all leading to an 88.0 pass-rush grade that ranked 10th in the nation in 2016. Last season, he played only 409 snaps and played a lot more coverage than he had in the past, but when unleashed, he still showed the pass-rush ability to make an impact at the next level. The nation’s top-graded center for two straight years, Ragnow can do it all in the run game, from moving nose tackles to locating and destroying linebackers at the second level. He’s strong in pass protection, and he’s proven capable of playing guard, adding positional versatility to the mix. With LG Andrew Norwell a free agent and C Ryan Kalil in the last year of his contract, adding depth to the interior offensive line should be a priority in Carolina. Alabama continues to churn out linebacker prospects and Evans brings an athletic presence who can fill multiple roles. He was more of an edge defender early in his career, and he pressured the quarterback on 67 of his 284 career rushes. However, he also showed well in a more traditional role over the last two years. 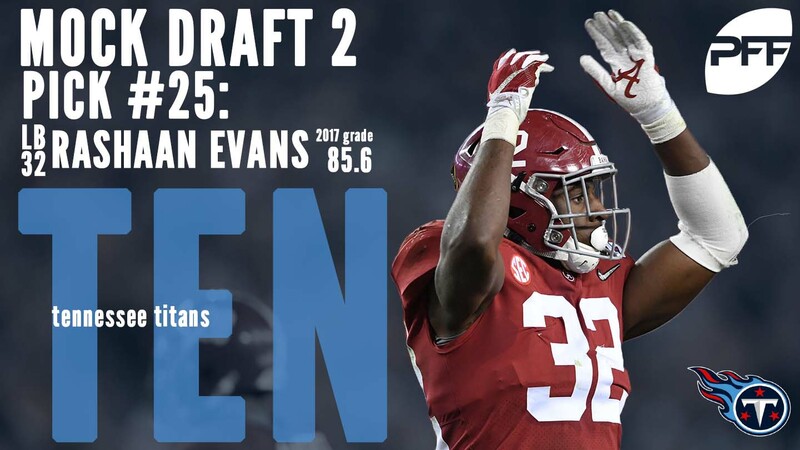 Evans brings a much-needed speedy playmaker to the Titans’ linebacking corps. One of the more difficult teams to peg as far as need and fit, the Falcons add another cornerback to the mix with Ward. 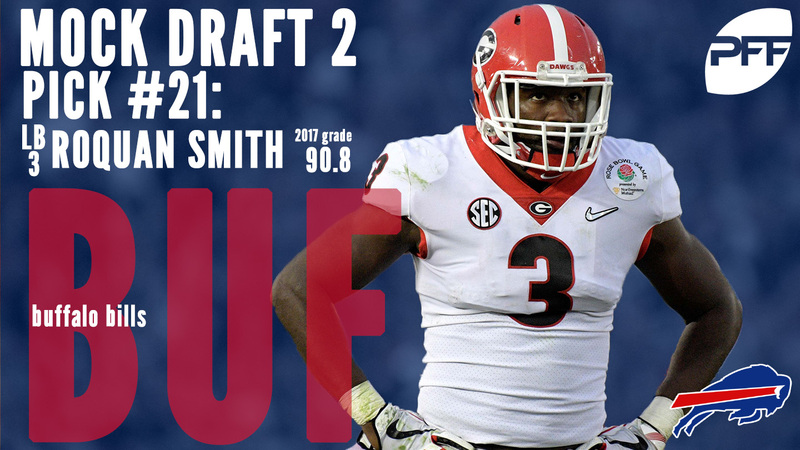 He has outstanding speed and quickness, allowing him to play both on the outside and in the slot, and his presence could turn Atlanta’s secondary into one of the league’s best units. He finished with the No. 3 overall grade among cornerbacks at 91.4 last season. The Saints took big strides on defense last season, but adding another presence off the edge will be an offseason priority. 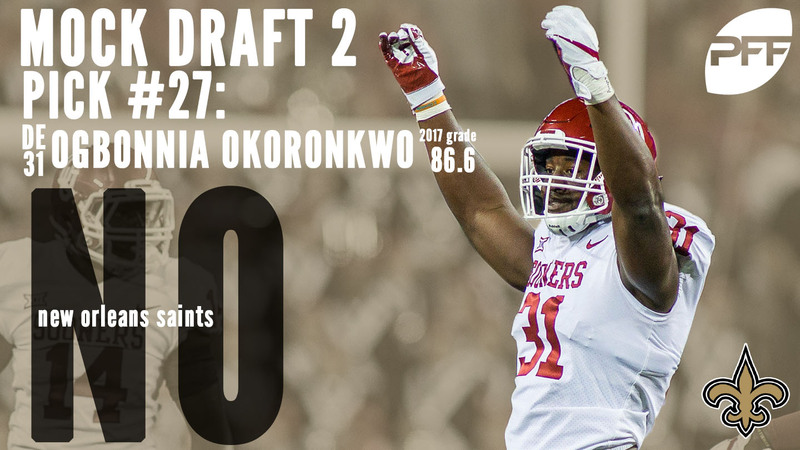 Okoronkwo picked up 23 sacks, 27 QB hits and 77 hurries on only 766 career rushes while picking up plenty of experience in coverage playing in Oklahoma’s scheme. He can dabble in a traditional linebacker role while doing most of his work rushing off the edge as a movable chess piece for the Saints. A loaded Steelers offense can still use a consistent middle-of-the-field presence at tight end, and Goedert has the size and athleticism to be a matchup weapon in the NFL. He’s performed well when facing FBS competition, and he just capped another productive year at the FCS level. The receiving corps has evolved this year in Jacksonville and could undergo even further changes heading into 2018. 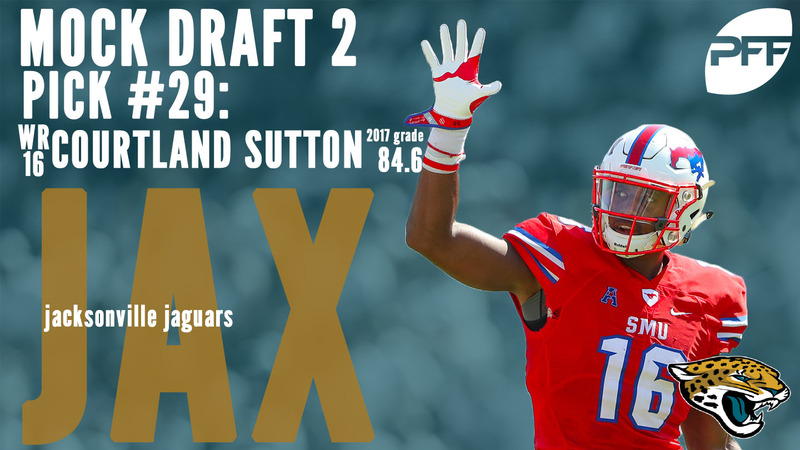 Sutton brings a 6-foot-4 frame capable of beating up on smaller cornerbacks and winning in contested situations, but he’s also been solid after the catch, forcing 26 missed tackles over the last two years. Offensive tackle comes off the board, as Crosby adds more talent to a Vikings’ offensive line that still has work to do to creep back toward league average. Crosby was the No. 4 run-blocking tackle in 2015 at 89.2 and ranked 14th overall in 2017 with an 87.3 grade. He’s improved in pass protection, allowing only four pressures last season. He’s also produced at both right and left tackle during his time at Oregon. With LT Jason Peters heading into his 36-year-old season, it’s time for the Eagles to address the tackle spot. Miller had a breakout 2017 season, finishing with the No. 9 pass-blocking grade at 88.8 while posting a solid 81.5 grade as a run-blocker. There’s a good chance that CB Malcolm Butler moves on in free agency, leaving a hole at outside cornerback in New England. Oliver has great size and does a fine job of staying on top of deep routes and making plays on the ball. He’s broken up 23 passes on only 146 targets during his three years at Colorado.